Learnovation is a one-day EdTech summit, which will be held at Croke Park on Wednesday, October 3 from 8.45am to 4.15pm. It is being organised by The Learnovate Centre, one of Europe’s leading research and innovation centres in learning technologies. 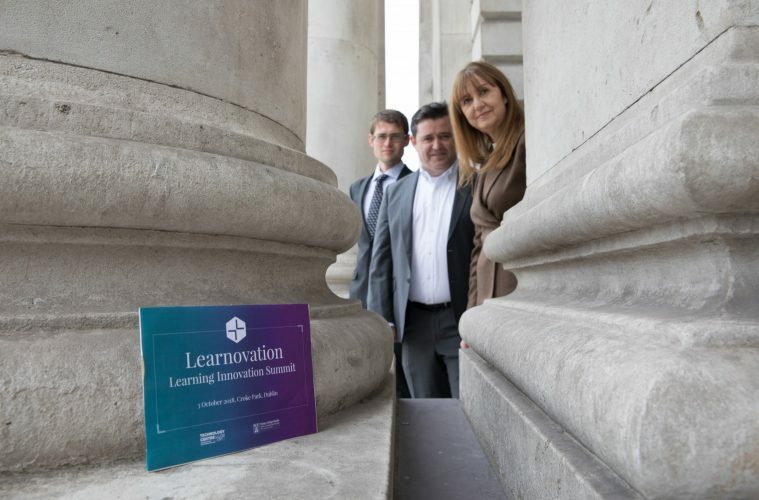 Funded by Enterprise Ireland, The Learnovate Centre is an industry-led technology centre based at Trinity College Dublin and made up of expert researchers using emerging technology to transform the lives of learners in the workplace, schools, at third level and in the home. This is the inaugural year of the Learnovation summit. While The Learnovate Centre has held many conferences and events on EdTech since it was established in 2011, this is the first summit of its kind in Ireland. The inspiration to start Learnovation came from the importance of Ireland further developing its strong reputation as a global leader in the EdTech sector. The world is transforming at an unstoppable pace and our future economy and society urgently need critical thinkers and creatives who can communicate and collaborate with people across the globe. The Learnovate Centre is focused on helping Irish companies stay at the cutting edge of developments in how technology is changing education and corporate learning so we wanted to gather experts together in one place to discuss how we can empower learners to be adaptive leaders in the digital age. Three different streams will be running throughout the day – the Leading, Learning and Innovation streams – looking at a range of issues from how technology, machine learning and AI are changing the face of education and workplace learning to leaders demonstrating how they are using gaming and virtual reality in formal and corporate learning. Those attending will discover the latest innovations in learning and development and how to go digital with learning. They will have an opportunity to meet experts in the EdTech field who are breaking new ground in this area. They will find out the latest research in psychology and neuroscience and how this informs how humans learn. They can learn about funding and scaling learning businesses and discover the supports available to them. A range of experts in EdTech including Abdul Chohan who is known globally for his pioneering work on improving learning through the use of mobile technology. At the school he founded in Bolon, UK, teachers don’t mark books anymore; they give voice feedback to students and his insights in this area are fascinating. Other speakers include: Peter Cosgrove, the founder of the Future of Work Institute in Ireland and Mairead Brady, Assistant Professor at the Trinity Business School, TCD, who will be speaking about how gaming is being used in learning at third level as well as David Whelan of Immersive VR Education. Visit www.learnovation.ie where you can see the full programme giving speaker times. Pinpoint the talks and panel discussions you want to attend in order to make the most of the day. Ensure you take the opportunity during the breaks and lunch to network and make connections with some of the leading lights in EdTech. You can book tickets through www.learnovation.ie Tickets cost €180 but member and group discounts are available. Contact Lorna at [email protected] or on +353 1 896 4910 for member and group discounts. There are a small number of tickets left but they are selling fast!